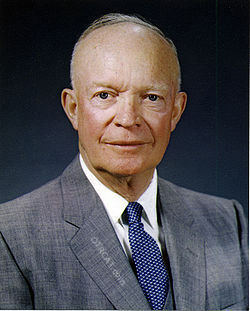 Dwight D. Eisenhower served as the 34th President of the United States of America with Vice-President, Richard Nixon. He held the office form April 2, 1953 through January 20, 1961. As President he led the nation during through much of the Cold War, negotiated with China to end the Korean War, enlarged Social Security, led the Nation in the dark days after Sputnik, and signed the Federal Highway Act which created the Interstate Highway system. Eisenhower, still a national hero after serving as Supreme Commander of the Allied Forces in Europe during WWII, won the 1952 Presidential Election over Democrat Adlai Stevenson by a landslide, ending two decades of the New Deal Coalition holding the White House. During his Presidency, Eisenhower pushed a doctrine of "Dynamic Conservatism." He continued and even expanded many New Deal Era programs. He maintained pressure on the Soviet Union during a time of Nuclear Fears. He helped to remove Joseph McCarthy from power. He would win a second term, again running against Stevenson, by another landslide. This collection contains his speeches during his role as Supreme Commander during WWII, Presidency and Post-Presidency. Be the first to comment on "Dwight D Eisenhower"
530202 Annual Message To Congress On State Of Union. 530726 Radio TV Announcing Signing Of Korean Armistice. 580224 Remarks At National Food Conference. 580715 Following Landing US Marines At Beirut. 590915 Welcome Chairman Khrushchev Ussr Andrews Afb.